Do you want to go a step further in bringing that authentic Bavarian beer garden or Oktoberfest experience to your own home? Well there’s a certain style of table and bench seat that anyone who’s been to Munich would be quite familiar with. 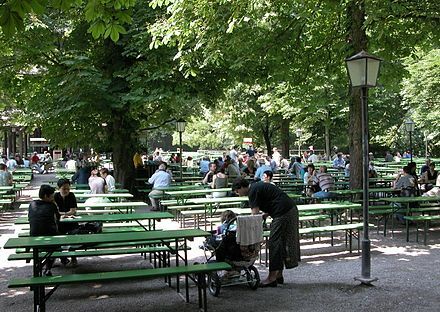 They’re in all of the Oktoberfest beer tents, they’re in the beer gardens at the Englischer Garten and Augustiner Keller and just about any other outdoor beer garden in the region. They’re strong, sturdy and built for beer drinking! You can cram in at least 5 people on each side and the seats can handle being danced on! BBT Import in Sydney sell authentic Bavarian beer tables. The traditional style tables are 2200 x 500mm and will set you back around $330 with a pair of bench seats, not including shipping. They also sell variations on the original including different colours and a wider 700mm version. The original 500mm table is fine for drinking and eating at, however if you’re wanting to put platters or similar in the middle of the table then things can become a little cramped. The tables do require a little wood maintenance if you intend on leaving them outside permanently in the weather unless they’re under shelter. Ideally they’re best packed away during the wet winter months to preserve them, however I personally like the weathered look mine has developed from 3 years permanently in the back yard. Check out their website at www.beertable.com.au.